and two brownies from another local shop. Mr FF used to walk across the valley and up to the farm where they are made to buy them and delicious eggs but now the lady has opened a shop in town so that's much handier but less healthy. In my proper stocking received several books, one of our charity shops is closing down and with everything at half price these were 25p each. I've already read the bottom one so that can go back, the others are destined for summer reading in Italy. and finally this packet of seeds made me smile so much, I know three kitties who might appreciate their very own grass to munch. This is the photo Mario sent us just before Christmas, the best present of all. I think we are all a little subdued by recent events in Berlin, and worried and scared too. 2016 has been a terrible year for acts of terrorism, for wars and displacement of people and for great political upheaval. No one knows what 2017 will bring but its important to remember all the goodness in the world and not to feel despair. I hope your Christmas is peaceful and happy however you choose to celebrate. Ours will be all those things and low key as always here in the penthouse, have a good one. So the madness intensifies. I walked into town yesterday for the newspaper, yes of course Mr FF reads the daily paper on line but with £10 of shopping at our local supermarket we get weekend papers free and I love having them. For some reason all the shops were full of vegetables, extra displays of large packs of sprouts, carrots and potatoes. I may have got it wrong but why do we need so many more greens a week before Christmas, next there will be panic buying and a sprout will be selling on eBay for a small fortune. Keep calm people please. There will be the same number of people in this country at Christmas, more or less, eating admittedly a bit more food than usual but this excess is horrible and I dread to think of the waste. My half hearted preparations are progressing, I have already spent £1.89 on three items for Mr FF and all the family gifts are wrapped ready for delivery sometime this week. We had our inmates Christmas lunch on Friday. It was a bit mental as most people had forgotten what they'd ordered in advance and the organiser hadn't taken the list. Some took other peoples orders which meant several dishes weren't claimed and other food had to be cooked involving a wait. At the end of the meal the restaurant provided bills for each table of 8 and sorting out individual costs, some meals from the festive menu, some off piste and then the drinks took over an hour, by which time my feelings of goodwill towards men had left. On a more positive note my dental extractions are fine, I spoke to my dentist after about 10 days as I was still in a bit of pain and was reassured and offered 24/7 advice if I continued to be concerned, I don't. And OK yes you can see our Christmas tree on the ground floor of the building. Mr FF and I with a few other neighbours put it up last Sunday, its beautiful as usual. The houses opposite and below us are well decked too and we get the benefit from our bedroom windows where this was taken. I hope your plans are going well and you have a calm week. I still have some pain after I had two teeth extracted a week ago so it's quite easy for me to be irritable at the moment but two things are really getting on my nerves. Technology and tinsel, let me explain. Mr FF loves to keep us up to date with the latest innovations, he's upgraded his mobile phone twice in the last few years and always hands me his old one. I don't use a mobile phone, I carry one for emergency use and since I never (touch wood) have an emergency the money I put on the phone has in the past expired before I can use it. So I never become familiar with different phones and although he tells me I can do wonderful life enhancing things with them I don't switch on. Nothing infuriates me more than to be with friends who are all heads down looking at their phones while I sit like a lemon, I should take my knitting or a book to occupy me during these periods of silence but of course taking out a book to read whilst in company would be considered rude, flicking through mail and apps apparently is not. I had a radio in the kitchen so I could listen to Radio 4 and the Archers whilst cooking. It was simple, already tuned into the right station I switched it on and switched it off as required. Now we have a Bose something system, touch sound maybe, basically box like devices in various rooms with practically no controls on them at all. These not only provide Radio 4 but other stations and music. If I want to change the music it has to be done via the computer, Mr FF tells me I can also do this via my phone. I'd like a system where you select a CD from the enormous stack we have gathering dust and stick it in the slot, or maybe even have my radio back. Now all the music in the world is available to me, if I could figure out how, it's too much. This week Mr FF has ordered a HIVE system to control the central heating, in the our apartment, again I'll be able to do that via my phone, tablet or laptop, ha ha. We'll be able to check what the temperature is in the penthouse when we are away, big deal. Actually I'm not worried too much about this upgrade as we hardly ever need the central heating on in our cosy penthouse, presumably I can still just turn it on if its needed. And the tinsel business. I'm just sick of reading all over the place about how to prepare for the perfect Christmas and particularly decorations. 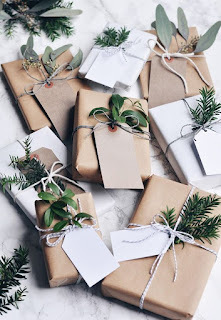 I see photos of presents wrapped with too many ribbons then dressed with sprigs of greenery and baubles, why would you give someone that, surely the foliage would die before the present was opened and how would you transport such fragile parcels in a car packed with gifts on your Santa run. 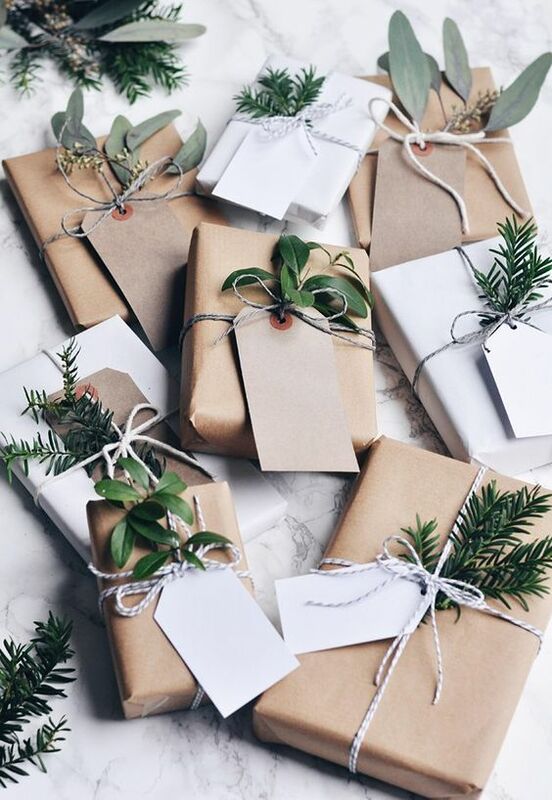 I think the value should be in the gift not wrappings that are to be thrown away. 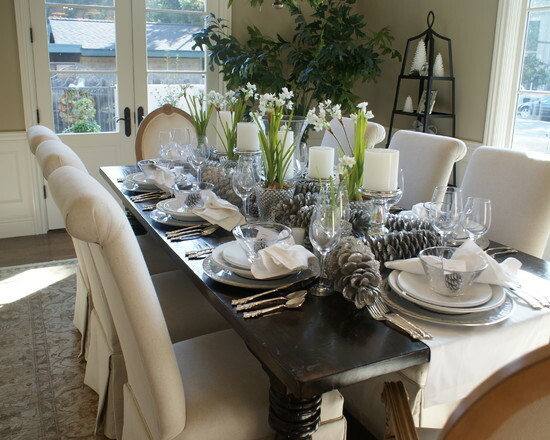 Perfect table settings are another irritant, give me strength. I like candles, I light a candle every day but I don't intend strewing my dining table with them and baubles and more greenery and plants, there's hardly room for the gravy. The perfect wreath seems to retail at around £100 and even pine cones you can pick up in the woods sell for about £12. No wonder people like me who teeter on the edge of bah humbug are pushed over. OK that's an exaggeration, I went over years ago, we had fish cakes for Christmas dinner last year and yes Mr FF and I will still operate our £5 limit on gifts to each other, despite the falling value of the £. I feel like some old car that's had an MOT and needs patching up at the garage. In the two weeks since I got back from Italy I've had my hair cut and my eyebrows tinted, they'd practically disappeared as many are white and the sun bleached the rest to oblivion. My hair is still fairly dark with some white so I seem to get away with darkish eyebrows and I do like not having to pencil them in every day, when I remember. I've made an appointment for my three yearly breast scan, I missed my turn whilst I was away and been to the doctors about the dizzy spells I've experienced recently. My doctor thinks they are probably a type of migraine. I suffered with debilitating migraines when I was working and thought they'd stopped, it seems they just take a different and when they happen rather scary form. We are monitoring the situation but at least I feel reassured that I probably don't have some life threatening condition. Most dramatic of all I've been to the dentist and had two adjacent crowned teeth taken out in preparation for dental implants. I won't go into the graphic details but getting one of them out was traumatic. My dentist was friendly and gentle, he almost moved me to tears with his kindness though I admit I was feeling vulnerable and emotional at the time. Now I have to wait six weeks for healing to take place before the next of seven appointments. I am still in a little pain on the third day, hating having to rinse my mouth frequently with salt water and hoping it's all going to be worthwhile and a good use of my savings. At 68 I don't want a mouth full of brilliant white and perfect teeth but I do want to laugh without displaying gaps. So that's a lot of interventions in two weeks, I would say I shall take it easy now but there is of course the dreaded Christmas. I've decided not to make a cake this year as we had half of last years still on the go beyond Easter. As usual I have no idea what we shall eat on the 25 but at least I shall be going into the festive season pretty sure that I'm in good working order and that I should keep motoring along for another year or so. We've settled easily into our Yorkshire life, it's always lovely to get back to the apartment and renew acquaintances with the inmates. We've already been to neighbours for drinks and tonight are next door for dinner so we feel very welcome. And now we have new curtains. We selected them before we went to Italy four months ago and they were made up ready when we got back. Unfortunately they couldn't be hung for a few days so despite the lovely day time view it wasn't exactly cosy in the penthouse at night with a large expanse of glass but well worth the wait. The special tape produces a wave pattern that gives dramatic pleats and works well as our track had to be hung from the ceiling to fit into the alcove for the doors. Calculating the fabric dimensions, hook spacings etc was a challenge for the engineer, of course they fit perfectly. So the penthouse is looking smarter and smarter, now with lovely views inside and out. Both make me very happy but maybe the outside one is still the winner. We've been back in Ilkley a couple of days and now it's snowing so I'm grateful we managed our long journey home in decent weather. We had good stop offs, the ferry from Calais to Dover was practically empty if a bit choppy and the drive back to the north of England wasn't too bad. So lets have some kitten photographs. Crema, female, Rosso, male and Grigio female. The coloured one is Lisa, the mother, the black one Theo the uncle and of course the kitties. They all liked to sleep on the terrace through the summer but moved into their apartment before we left. So we miss them terribly and are of course a little worried but Marzio survived six months without us. These three are older and stronger so we are just hoping for the best and plan to get back to them as soon as spring arrives. We leave our house in Lazio tomorrow and start the long journey home to Ilkley. I hate this part, packing the house, saying goodbye to friends, anticipating long days in the road and worst of all leaving our three kittens, now six months old. Crema, Rosso and Grigio have all been sterilised and are doing so well. There are 15 large assorted bags of food for Mario to top up their feeder, two pillows in the insulated cat apartment, I really hope they will stay around until we return. Whatever happens they've had a good start in life and we won't be coming back to more kittens from the two females. My brother and sister in law arrived two weeks ago and helped us pick the olives. Not so many this year but despite half the crop of last year we had an amazing yield and came home from the mill with 25 litres of really tasty oil. Friends and neighbours are amazed and I forgave the people at the mill who told us the oil would be ready at 4 after we dropped off our harvest at 9.30. We returned around 4.30 and we'd actually moved back in the queue. The process eventually started around 6 and though we didn't really have enough olives to qualify for our own run they didn't mix us with anyone else and you should have seen our smiles when the oil just kept coming. 10 litres are already packed in the car. So once I'm back I'll share some photos, cats mostly, meantime we are out tonight for one last pizza before an early start tomorrow for Piedmonte, our first overnight and our last day in Italy this year. I called in at our village post office thinking I'd stock up on stamps to avoid the incident in my previous blog post. I waited patiently and when my turn came I asked for five one euro stamps. No no said the man, we have no stamps, no stamps at all I asked, not of any other value. No he said. Where can I buy stamps I asked, try the tobacconist he suggested. Of course the tobacconist had none, the lady suggested I try the post office. Later in the mini market a lady who has seen me in the post office asked if I'd found stamps, no I replied, we are a village without stamps. She suggested I try the main post office at Anangi, about 10 miles away, actually I think I might invest in a pigeon. Friday we were in the little spa town of Fiuggi where I bought a postcard to send to Amelia my great niece as I'd missed her seventh birthday. We had time to kill so wandered around and slightly out of the town where I came upon the post office and decided to get stamps. I intend to send Esme a card later for her birthday. I fathomed out which counter I needed, no 4 for stamps and general posting, the others for banking, bill paying etc and took a number for no 4. There were a couple of people before me so I decided to start writing the card, post boxes being few and far between in these parts. When it was my turn I asked in my best Italian for two stamps for postcards to England, tap tap on the computer for a while till she told me it was a euro each. Give me the card said the lady and I handed it over, half written and with no address. She looked at it and I said I hadn't finished, finish it she said rather abruptly tossing it back with a pen. So I stood at the counter hastily penning a few words and finding the addresss from my diary, not daring to look round at the queue building behind me. I handed the card over, much more tapping of the computer, then the lady said give me the other card. I explained I hadn't bought it yet. I wanted the stamp to take away. I realised at this stage that she intended to frank my completed card rather than give me two stamps. She looked at me then shouted down the line of counters, she wants a stamp to take away as if I was some kind of freak Eventually an assistant from another till went into the back room and came out with the requested stamp, with a lengthy code written on it in pencil that had to be tapped into the computer. At this stage I was reminded of the days when you took your building society pass book to pay in a couple of pounds and all the tapping that involved. Finally I got my single stamp, my completed card was thrown on top of the printer and the lady looked down her nose at it, maybe she was pretending to read it. I never saw it franked, I have no idea if it will ever arrive, I wish they had stamp vending machines in Italy. My turn to get up first this morning, open the shutters to the sunshine, feed the cats and make a pot of tea. I could hear dog activity in the olives below our house, the hunting dogs wear bells so they owners know where they are as do we and the cats. The noise got nearer, the cats came indoors and I wandered onto the terrace still wearing my dressing gown to see a man with a gun coming up the steps into our garden. I shouted good morning, I think he was as surprised as me, returned my greeting, apologised and turned back into our orchard. I asked if there was some animal in the orchard but he didn't answer. The dog activity, barking and howling, continued in the orchard for a while, then receded down the slope until there were three shots. I have no idea what the man was hunting but after that he seemed to disappear and silence returned. We are in a region designated for hunting wild boar and last Sunday there was much shooting on the mountain above us. We took a late afternoon walk to the village and were passed by two pick up trucks, one of which had a dead boar in the back, a massive creature with large tusks. The hunters drove through the village blowing their horns as they do at a wedding, obviously wanting everyone to see their success. My neighbour told me later the creature had been killed just above us. I hope this mornings hunter wasn't on the trail of a boar, we have had evidence in the past of them rooting in the orchard and on our lawn, I don't want to meet one face to face. Rumour has it they are becoming more confident around property in the way of urban foxes and more aggressive too. Life in Italy, it certainly has its wild side. It was confirmed that I am the worlds worst blogger when I had an email from Canada asking if I was OK as I hadn't posted since the earthquake. I haven't posted as I'm not sure you want to hear more about the lovely weather, delicious food and local wines straight from the vineyard, one of which has been crossed off the list since their large German shepherd dog attacked our car and scratched it down to the metal. A pity as their wine is good. In fact we've had many car problems and at one stage I didn't leave the property or see anyone except Mr FF for two weeks. At first I enjoyed the solitude, all our neighbours had moved back to Rome but after a week I started to go a bit stir crazy. Two days after our car was repaired in a nearby village taking several days and costing us 250 euros the exhaust pipe came loose fortunately in our own village so we limped to the little garage here with Mr FF driving slowly which I crawled alongside holding up the dragging pipe with a golf umbrella. The mechanic confirmed the problem was caused by the previous work and fixed it temporarily, ordered a new clamp, installed that and charge us 20 euros. We would have used the village garage in the first place but he was busy and recommended the other place. Big mistake. We've done all the usual things, enjoyed many festas in various little squares, made new friends, visited and been visited by old friends, been for a weekend at the sea and loved having our little kitties around, two are asleep beside me on a chair the other tightly curled up in the waste paper basket. Today we are off to the airport as friends are coming out from Yorkshire for a few days, unfortunately the forecast isn't great and it's been raining, it will be such a pity if for the first time in three months we can't have breakfast outside. So there you are, things are much as they always are in Italy which suits me just fine but doesn't lead to much interesting blogging but I will try harder to keep you up to date in future. We knew nothing of the quake in central Italy until we saw the news this morning, as the crow flies we are not so far away. A few years ago the L'Acquila quake about the same distance away shook some pots off the kitchen shelf though the people in the house at the time managed to save my precious teapot. We have the Italian news on the tv it's dreadful to see the devastation and we feel so sad though deeply touched by the texts and messages we are receiving from friends and family at home, thank you for caring it means a lot. I've always enjoyed hearing the sheep, their bells tinkling, as they are brought early evening to graze amongst the olives and happy, if a little wary, to see the large white sheepdogs that accompany them. This year the shepherd has been bringing his large flock to the olive groves immediately above us, I spoke to him briefly one evening telling him his animals were beautifully, to which he agreed. Then one night two of the six dogs were on our drive, I like to think guarding my geraniums and other pots of flowers at the back door because the sheep were down on our road with the shepherd. We asked him where he lived, not far away, and if he kept the sheep for milk which he did. He said he made ricotta and sold it on Saturdays to our neighbour Anna, I said I would speak to her about it as I was interested. On Saturday morning I saw a vehicle down at Anna's and then a car horn outside our house with shouts of ricotta. We went out and I bought a beautiful mound of soft snowy white ricotta, which I'm usually not that keen on. Then the man asked if we'd like some cheese and showed us huge wheels of pecorino and smaller ones of a soft salty cheese. I ended up with about 1.5 kilo of pecorino a staginato, a firm salty and slightly open textured cheese. Both our purchased are completely delicious, the ricotta really needs to be eaten straight away, it was wonderful that evening after dinner with peaches but is became a little tasteless and was finished off on bread with jam for breakfast. We have give away slabs of the pecorino and eaten lots ourselves, it is so delicious, and everything was exceptional value, delivery included. The shepherd is coming back this Saturday and we shall buy more, fresh local produce, about one food mile involved and we know the sheep personally, what could be better. I plan to give the man some of the cheddar we brought from home, most of our Italian friends love it and we've given lots away, mass produced mousetrap, I wonder what he will make of it. nine days later I was just giving my pots at the back door an early evening water and putting the rubbish out when Marzio walked down the road, tail in the air. He's skinny and far too interested in food for much cuddling, let's hope he isn't just hear to refuel. Everyone who said he'd return was right, I obviously have a lot to learn about the Italian male. Late Sunday evening over a week ago Mr FF sat out on the terrace under the stars with Marzio on his knee, I would say cooling down after another hot day but you probably don't cool much with an adult cat sat on top of you. He said Marzio was very relaxed, purring and happy, eventually around midnight he had to carry him to the bed under the garden table where all six cats sleep and Marzio hardly woke. We didn't see Marzio next morning but didn't think much of it, we haven't seen him for nine days now. We no longer get up expecting he will be at the door waiting for food with the other five. We've called him and searched as much as is possible on the side of a mountain with heavy undergrowth, we've checked with neighbours and driven round. Everyone says he will have gone off looking for a girl friend but I can't imagine any male missing out on two square meals a day for love. He can't be locked in anywhere as the two sets of families in our road over the weekend had left long before we last saw Marzio. It's heart breaking that the funny little kitten that arrived a year ago survived all the perils of predators and falling off high walls, that managed six months without us, albeit fed by Mario and the automatic food dispenser, should just disappear. He was strong and capable from the start, hated being fastened in the cellar overnight snd was happy to sleep out tucked between his mother Lisa and Theo our very timid black cat. He was definitely an outdoor creature, he was friendly with us but wary of strangers, he was gorgeous and and we loved him, this not knowing is dreadful. Yes I know, we've been at the house two weeks now and not a word from me. Even Mr FF who likes to keep me off the iPad has complained about the lack of blogging. After the trauma in France when we found it hard to find words to express our sadness, we had the most wonderful welcome into Italy. We stayed at an amazing little three star family run hotel in the hills above Portofino, somehow we always get attracted up above the main drag. Swimming pool, lovely room, gorgeous modern bathroom, tea and coffee, slippers, pre dinner drinks with enough snacks to make a meal, generous to a fault the owners couldn't do enough. We dined amongst noisy tables of large families and tourists, four courses and after each one we were offered second helpings, wine was red or white nine euros. After dinner kids went off to play table tennis and football, adults chatted on a terrace bright with candles, we felt so content and delighted to be back in Italy. Of course our house was very dusty, full of cobwebs and dead insects as usual, the garden full of weeds but over two weeks that has been sorted and we are enjoying our usual dolce vita. 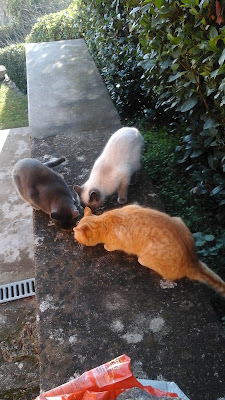 And I know you are wondering, yes Theo Lisa and Marzio are all here ...... wait for it ........ with three kittens about four months old so now we have a family of six. The kittens Grigio Rosso and Crema are becoming tame and delightful, all in good condition and loved by our neighbours who along with Mario have kept them fed for us. It's hot, into the 30s and we are not fully acclimatised yet so we haven't ventured far. The August holidays begin this weekend and we have three days of festa in our village concluding on Sunday evening with a beauty contest and male strippers in the piazza, this in a place with seven priests, many nuns and on a Sunday. Welcome to Italy. We spent last night in a beautiful restaurant with rooms in the hills above Nice, a happy busy place with charming staff and an international mix of customers enjoying delicious food in a fabulous setting. We heard before we went to bed something had happened in Nice and today the dreadful news that many many people enjoying their national holiday have been slaughtered by cowardly terrorists. It seems so much worse because we are near, this sunny morning is full of sadness and shock. My heart goes out to the people of France. So it begins, the packing in anticipation of months away, the travel itinerary, the freezer to empty. Yes all happening but for now I've got my toe nails painted for our journey which starts apparently at 3 am on Wednesday morning. These are my new sparkly sandals, a bit smarter than the usual flipflops though many pairs of the latter will be worn believe me. I've packed a few pots of nail polish for the duration though I'm pretty certain I have a good stock already in the house. I'm particularly liking the blue that I've been wearing for the past few weeks. Lots of colours in my knitting bag too with various odds of yarn that I have every intention of using, plus my grammar book for reference en route. I'm knitting some plain socks in these girly colours, hopefully there will be more consumption during the journey. I'm making the pattern up as I go along, I'll probably finish the toe with the contrast and maybe have a different stripe in the second sock. The new curtains for the lounge are sorted too, the main body will be beige, I think it's called twine, with a bottom edge of dark brown and the tiniest line of red between the two. Mr FF has installed the track, the curtains won't be made until we know when we are coming home but nice that we won't have bare windows over the winter. Winter, lets not talk about that, though this time I must take some sensible shoes for the journey home, not that we want to mention the journey home either. We should be in our house by the weekend and may catch a stage of the Tour de France on the way. Quite days here in the penthouse as we contemplate the move out to Italy. A few snagging problems with the doors are fixed so nothing to keep us now. We are enjoying sitting out in the sunshine and moving inside to admire the rain sheeting down the glass when showers appear. It's Tour de France time so there's much afternoon telly and knitting until things get exciting when I drop everything as on the first day when Mark Cavendish won the sprint to take the yellow jersey. I've knitted up my 25p ball of cotton, a large dish cloth above and a small wash cloth below. I don't normally use a flannel or cloth but I do like to see a couple of these sitting prettily in the bathroom, the pink is one I made earlier. Then of course there are socks, another pair of Earl Gray by Yarn Harlot. I've knitted these before but checking Mr FF's sock drawer I think he may have worn them out or they are living in Italy. Anyway I enjoy the pattern though as usually I'm having problems knitting such a dark yarn in the evenings. And obviously couldn't take a decent photo of them to save my life. I always feel that the summer is over once the Tour finishes, this year may be different because really our proper summer will just be starting when we get to Italy. We heard that the veggies we planted are doing well, the cats are still around and our Danish friends want us there by August when they have a lull in their usually busy social calendar. Meantime I'm wearing my flipflops here in Ilkley, there's a lot to be said for this place. When I worked in occupational psychology one of the training models used was the Forming, Storming, Norming, Performing . This team development tool was introduced by Bruce Tuckman in 1965 and demonstrates the phases necessary and inevitable in order for a team to grow, to face up to challenges, to tackle problems, to find solutions, to plan work, and to deliver results. As you know I'm no great promoter of management jargon but I do think at present our country is very much in a storming stage although our government and opposition parties still need a bit of forming, or reforming too. I'm finding it very disappointing that the fighting, scaremongering and nonsense continue. Let's hope we can quickly move onto the norming stage when things settle down and people begin to work together. I had fully expected on Friday that Extra Energy would tell us they couldn't pay our refund as promised since the UK had opted to come out of the EU, so far they've found some pretty far fetched excuses. Surprise surprise, the money went back into our bank account though we didn't receive the promised telephone call to discuss compensation. And a stash enhancement as you never know, we might not be able to get yarn any more when the exit negotiations are complete, I've already seen people bemoaning the fact there will be no more French wine. A local charity shop had a wonderful basket of single balls of yarn at 25p each, worth spending £1 however low it's value against the euro. I got 2 x 50g balls of Adriafil, made in Italy, pure wool in a lovely lavender that will make a nice cowl, a ball of beige cotton, feels like pure cotton, that will make a wash cloth or two and a ball of something soft and silky that feels like Noro which I hope might be enough for a pair of fingerless gloves though it does seem very delicate so perhaps not. Just as well we've got the steps finished, some might say there will be no more Italian travertine now. And yes it was a stormy day when I took the photo, still wonderful though. Yesterday the travertine for the steps out onto the balcony was delivered. It is gorgeous, an elegant and natural material that perfectly matches our fireplace. I am all smiles again and today it is being fitted as I type. Work should be finished this evening but for now we are back to dust sheets, noise and apart from making coffee I have little to do and nowhere to sit. Bit of knitting progress though. This is Cancun boxy top by Erin Kate Archer. It's a simple but clever pattern that you can adapt to suit yourself. It's simply a case of knitting two rectangles, how easy is that. I made a longer top than the pattern suggests by adding more bands of texture and knitting 8 rows of garter stitch rather than 4 between each band. I used 7 x 50 g of a linen cotton mix dk I found in a charity shop for £4, basically I knit one side until I'd consumed half my yarn. It's such an adaptable pattern that would look good with a plan yarn but looks great with this knobbly one. The pattern bands were interesting to knit and I'm sure more intelligent knitters could add their own, we all know how lazy I am. Let's not dampen my parade, we are told by Extra Energy that we should receive our long promised refund tomorrow. Watch this space, meantime concentrate on the positive if rather beige progress above. It's a poor show really but maybe just as well I didn't make great progress as my stash was inaccessibly packed away under plastic sheeting. I had to use the recently purchased yarn and might have been tempted to buy even more. As part of his recovery Mr FF has taken himself off for a few days walking, he's finishing off the Dales Way, most stages of which he has completed from home, but the more distant stretches involve a couple of overnights and then a train back from the Lake District. So I am having a bit of me time, sitting out a lot on the balcony in glorious sunshine and yes back to knitting in front of the telly. There should be a complete pair of socks waiting for him when he gets home. I'm thinking of changing my blog name to My Rant in Flip Flops, I know I've gone on and on about our buildings works and also about our debacle with Extra Energy but the latter continues. I thought we had it all sorted when we got our monthly payment reduced to £70 and were told we'd receive the £600+ we were in credit back into our bank account within 10 days. Of course the money didn't return so after over 2 weeks I phoned customer service, as its laughingly called, again. They said the payment had been rejected, nice of them to keep quiet about that. It transpired that though I had given them a current meter reading it hadn't been passed on, the robot I spoke to said he would put the correct information through and I'd have my money back in 21 days. Having been promised 10 days, admittedly that didn't happen, I asked why it would take so long. Apparently they have a new system in place and it's not really up and running yet so there is a delay. I ranted on as usual, got extremely cross and gave up. Next day we received a revised bill, obviously the meter readings had now been passed through. In 16 months we had used just under £1,200 of power, are now £750 in credit so they had decided to up our monthly payment to £129. I was beginning to think Extra Energy are carrying out some personal vendetta against me. The Customer Services bloke this time said that it was the system that made the payment adjustments and when I suggested that someone had set up the system to do that he laughed. I wish I could laugh about this crazy situation, I wish we could have our money back and find another provider. Last night Mr FF read in the paper that Extra Energy has the worst ever number of customer service complaints against any company, they have responded by described the situation as challenging and apologised to their customers. I won't give up because I like a challenge too but my goodness it's exhausting, infuriating and all caused by their inefficiency and inabilities. I might just phone them and see if they've read the article. Have a calm weekend, I shall mostly be dusting whilst ranting. Finally we have our life back, this morning the fitter came to reinstate the carpet and install new underlay, we moved the furniture back, we breathed a sigh of relief and relaxed. At last we have a lovely clean calm room, well almost, the steps and outside balcony still need to be surfaced but that can wait a while. Actually in desperation on Monday evening we put down some of the old underlay, uncovered the sofa and the telly and sat in the lounge, it was so relaxing just to be in there and we both slept really well that night. Now man, comfy chair and telly are properly reunited. We love our new look room, the light and the view are amazing, it's been six hard weeks but I'm sure in a few days that will be forgotten, particularly if I ever manage to get rid of all the dust. Next we need to decide on new curtains, that's the fun part. And we have friends coming to visit tomorrow, they want to see our new vista, I want to see their faces when they do.